Proportional Thermoelectric Controller for IceProbes. The exact temperature set point is fixed by adjusting with a Philips head set point dial. 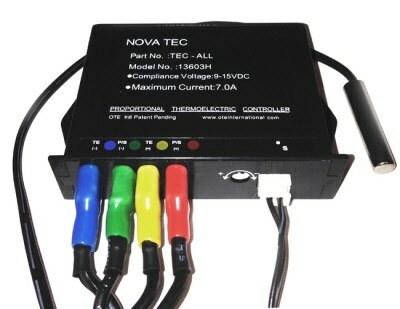 These controllers feature an 18 inch long waterproof temperature sensor and all the electrical connections to allow for simple installation between the IceProbe and the Power Converter. The Temp Controller is not required for use with the ice probe but makes setting a set point possible. Temperature Controllers Coolworks Proportional Temperature Controllers are available in four preset temperature ranges. The exact temperature set point is fixed by adjusting a Philips head set point dial. Our controllers feature an 18 inch long waterproof temperature sensor and all the electrical connections to allow for simple installation between the IceProbe and the Power Converter.